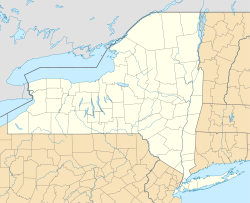 New Berlin /ˈbɜːrlɪn/ BUR-lin is a town in Chenango County, in central New York, United States. The population was 2,682 at the 2010 census. The town contains the village of New Berlin. The town is at the east border of the county and is northeast of Norwich. The first European-American settlers arrived around 1790, after the American Revolutionary War. This followed the Iroquois League nations being forced to cede most of their territory to the United States following the defeat of their ally Great Britain. The Mohawk and other Iroquois nations moved to Ontario, Canada, where they were granted some land by the British Crown in compensation. Some small reservations were set up for them in New York state. The Town of New Berlin was founded by a partition of the Town of Norwich in 1807; it was named after Berlin, Connecticut, from which many new land-hungry Yankee settlers had come. In 1821 the town changed its name to "Lancaster", but returned to "New Berlin" the next year. In 1853, part of the town was used to form the Town of Sherburne. According to the United States Census Bureau, the town of New Berlin has a total area of 46.6 square miles (120.6 km2), of which 46.1 square miles (119.5 km2) is land and 0.42 square miles (1.1 km2), or 0.94%, is water. The east town line, marked by the Unadilla River, is the border of Otsego County. The Unadilla is a south-flowing tributary of the Susquehanna River. New York State Route 8, a north-south highway, intersects New York State Route 80 north of New Berlin village at Five Corners. New York State Route 23 is an east-west highway running east from Norwich. As of the census of 2000, there were 2,803 people, 1,083 households, and 737 families residing in the town. The population density was 60.4 people per square mile (23.3/km²). There were 1,358 housing units at an average density of 29.3 per square mile (11.3/km²). The racial makeup of the town was 98.14% White, 0.36% Black or African American, 0.14% Native American, 0.14% Asian, 0.04% Pacific Islander, 0.25% from other races, and 0.93% from two or more races. Hispanic or Latino of any race were 1.21% of the population. There were 1,083 households out of which 32.0% had children under the age of 18 living with them, 55.3% were married couples living together, 9.1% had a female householder with no husband present, and 31.9% were non-families. 26.4% of all households were made up of individuals and 13.8% had someone living alone who was 65 years of age or older. The average household size was 2.51 and the average family size was 2.96. In the town, the population was spread out with 25.6% under the age of 18, 5.6% from 18 to 24, 26.5% from 25 to 44, 25.4% from 45 to 64, and 17.0% who were 65 years of age or older. The median age was 40 years. For every 100 females, there were 89.6 males. For every 100 females age 18 and over, there were 86.9 males. The median income for a household in the town was $31,875, and the median income for a family was $40,000. Males had a median income of $27,411 versus $21,348 for females. The per capita income for the town was $16,546. About 10.5% of families and 16.1% of the population were below the poverty line, including 23.8% of those under age 18 and 10.6% of those age 65 or over. Amblerville – A hamlet northwest of South New Berlin. Chenango Lake – A hamlet in the western part of the town, adjacent to a lake of the same name. Chenango Lake – A lake located by the hamlet of Chenango Lake. Davis Crossing – A hamlet south of New Berlin village on NY-8. Five Corners – A hamlet in the northeast corner of the town, north of New Berlin village. Holmesville – A hamlet at the southern tip of the town, south of South New Berlin on Route 8. Hunts Pond State Park – A former state park in the east-central part of the town, managed since 2011 as part of Hunts Pond State Forest. New Berlin – The village of New Berlin is located in the northeast part of the town on NY-8. Its eastern border is the east town line and the Unadilla River. Mill Brook Reservoir – A lake located west of the village of New Berlin. New Berlin Center – A former community by the east town line. Sages Crossing – A hamlet near the east town line on NY-8. South New Berlin – A hamlet near the southern end of the town on NY-8. ^ a b "Geographic Identifiers: 2010 Demographic Profile Data (G001): New Berlin town, Chenango County, New York". U.S. Census Bureau, American Factfinder. Retrieved November 20, 2014. ^ "DEC Takes Ownership Of Hunts Pond State Park". WBNG.com. May 6, 2011. Archived from the original on March 3, 2016. Retrieved February 21, 2016. This page was last edited on 13 May 2018, at 17:30 (UTC).